Borderlands has a reputation for including some frankly ridiculous guns, and we all love it for that. 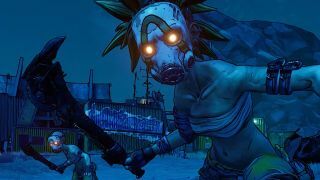 Well, Borderlands 3 isn't changing that winning formula, as it's going to include a gun on legs that shouts insults at your enemies. Just imagine that trotting alongside you on the battlefield. If there's anything that'll cheer you up when you're running dangerously low on health, it's hearing a tiny mechanical voice yell obscenities at the fools who are trying to kill you. Perhaps this gun is even an evolution or offspring of Borderlands 2’s gun Bane, which screamed when you fired it. Don't ask me how gun offspring would work, but Borderlands would probably find a way. Thought that gun sounds nuts? Well, there's also one which has self-propelling bullet shields and another that spawns volcanoes. Yes, volcanoes. Imagine that appearing in the middle of Pandora. I really, really hope they make lava shoot out of the ground and propel enemies up into the air while horribly burning/cooking them. Because bullets that deal fire damage just aren’t good enough. I don't know what kind of mad scientist shenanigans has to go on in the labs of megacorporations like Tediore or Maliwan to create weapons like that, but something tells me it probably includes a pile of illicit substances or maybe just a healthy disrespect for common sense and one hell of an imagination. I pity the labs’ poor test dummies, I really do.